Today is another important day at the Cincinnati Reds minor league complex in Goodyear, Arizona. Following the arrival last Thursday of Reds minor league pitchers and catchers, coaches, and trainers for spring training, all remaining position players are due in camp today. The first spring game of 2019 in Arizona for the Dayton Dragons is March 15 when the Dragons meet the Lake County Captains, the Cleveland Indians Single-A affiliate. As explained in our first positional preview, there will be a lot of competition for the 25 spots on the Dragons roster. There are 234 players in Goodyear who are under control of the Reds, with 125 total roster spots available, including the 25 big league jobs plus four full-season Minor League teams with 25 roster positions each. Those include the Dragons, Advanced Single-A Daytona, Double-A Chattanooga, and Triple-A Louisville. Chattanooga returns as a Reds affiliate in 2019 after partnering with the Reds from 1988-2008. The Reds Double-A affiliation had been in Pensacola, Florida from 2012-18, but Chattanooga (the Lookouts) is now back in the organization. This is the second of an eight-part series previewing the 2019 Dragons. Players listed here are candidates for positions on the 25-man Dragons season-opening roster. Candidates: Rylan Thomas, Jake Turnbull. In past seasons, it was fairly easy to project the members in the Reds farm system by simply looking at the previous year's statistics for the Billings Mustangs, the team one level below the Dragons in the Reds farm system. If a player had a good year in Billings, he typically moved up to Dayton the next season. While that is still true, the Reds added another affiliate at the same classification level (Rookie-level) as Billings in 2018, the Greeneville Reds in Tennessee. This should be a good addition for the Dragons, as there are now twice as many players to pick from each spring to construct the Dayton roster. The leading candidate to play first base for the 2019 Dragons was a Greeneville player in 2018. The first base position at Dayton in 2018 mainly featured two players, Montrell Marshall and Leandro Santana. Marshall has retired from professional baseball, and Santana, whose primary position in previous years had been third base, will be previewed at that position next week. Santana is a candidate to return to Dayton and could see some action at first base in 2019. The Billings team featured somewhat of a revolving door at first base, with 10 different players playing there over the Mustangs 76-game season. Only one player played more than 15 games with Billings, Pabel Manzanero, primarily a catcher, who was previewed in our first installment last week. On the other hand, the new Greeneville affiliate featured an everyday first baseman, Rylan Thomas, who figures to move up to the Dragons in 2019. 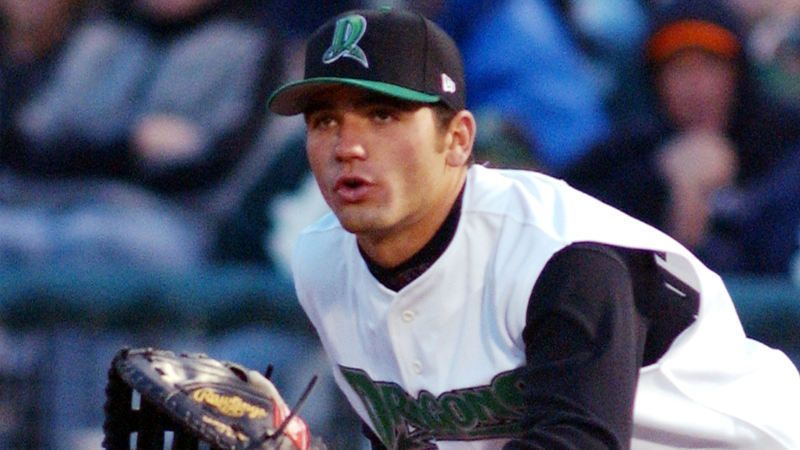 Rylan Thomas has some obvious similarities and connections to former Dragons first baseman James Vasquez. First of all, they played the same position at the same school. Vasquez starred as a first baseman at the University of Central Florida from 2012-15. Thomas came along in 2017 and played two seasons at UCF as a first baseman (and pitcher). The two players had similar best seasons at Central Florida. Vasquez, in 2014, batted .340 with eight home runs and 56 RBI. Thomas, in 2018, batted .343 with 13 homers and 55 RBI. Both players were selected by the Reds in virtually the same point of the draft (Vasquez in the 25th round; Thomas in the 26th round). Both players have similar physical dimensions (Vasquez was listed at UCF at 6'0", 230 lbs. ; Thomas at 5'11", 235 lbs). Vasquez was the Dragons first baseman in his first full season of professional baseball, and Thomas is expected to do the same. Thomas is a native of Winter Garden, Florida, about 20 miles north of Disney World. He made an impact at the University of Central Florida under former Wright State head coach Greg Lovelady, right from the start. As a true freshman in 2017, he was named Freshman All-American by nearly every college baseball publication. He was also named the American Athletic Conference Freshman of the Year, and 2nd Team All-Conference. As a freshman, Thomas was the best hitter on a team that advanced to the NCAA Regionals. He hit 14 home runs in 59 games and batted .303. He also led the team in RBI with 53. Thomas returned to UCF for his sophomore year and was even better. In the spring of 2018, he improved his batting average to .343 while hitting 13 home runs with 55 RBI, posting a great OPS of 1.034. He also improved his walk total and cut down on his strikeouts. While Thomas lasted until the 26th round of the draft, the Reds clearly made him a priority to sign. He reportedly received the sixth largest signing bonus of any Reds 2018 draft pick. After signing with the Reds, Thomas was assigned to Greeneville of the Appalachian League. He opened his pro career by going 0 for 10 in his first three games, but from that point forward, he was a solid hitter and had streaks of tremendous success. He was the Reds Minor League Player of the Month for July, batting .316 with nine home runs in 26 games. From July 8-28, Thomas played in 18 games and had home runs in eight of them. Over an eight-game stretch late in the month, Thomas batted .577 with four home runs and four doubles. The slow start had an impact on Thomas' final batting average as he finished the year at .257 with 10 home runs, 33 RBI, and an OPS of .892 in 55 games. RedsMinorLeagues.com posted this comment on Thomas' home run power: "He's capable of hitting home runs in any park, and to any part of the park. If he fully develops, he's got 35 home run potential." Thomas is rated as above-average defensively at first base with a strong arm. Late in the 2018 season, he began seeing playing time at third base (10 games), and he could play there at times for the Dragons in 2019, where his strong arm becomes more of a benefit. Australian prospect Jake Turnbull got some attention when he signed with the Reds as a 16-year-old in the fall of 2014. Turnbull's career got off to a good start in 2015 when he batted .291 as a catcher with the Goodyear Reds in the Arizona League. Baseball America ranked him as the #26 prospect in the Reds system and called him "one of the better prospects out of Australia in recent years…he had an outstanding debut (in 2015) as he showed savvy and baseball intelligence." Unfortunately, since that promising start to his career, Turnbull has never been able to stay healthy and have a full season of development. Over the three years since 2015, he has played in just 67 games and totaled just 198 at-bats. Now a corner infielder, Turnbull played at Billings in 2018 and appeared in 19 games, batting .242 with one home run in 62 at-bats. Even in his fourth season at the Short-Season level, Turnbull was still younger than the league average in 2018 with Billings, so he still has time to progress if he can make the Dayton roster in 2019. As stated in the first positional preview, top catcher candidates Jay Schuyler and Pablo Manzanero both saw significant time at first base in 2018 at Billings and both could play there in 2019. Leandro Santana played in 54 games at first base with the Dragons in 2018 and will be previewed at third base. Bren Spillane, a strong outfield prospect, played in 15 games at first base in 2018 at Billings. He will be previewed with the outfielders. The final spring game for the Dragons and many former Dragons will be played in Dayton on March 30. The Dragons will host their "20th Season Celebration Game" on that date at 2:00 p.m. at Fifth Third Field. The game will match the 2019 Dragons ("Team 20") against a team of Dragons alumni who are still playing in the Cincinnati Reds minor league system. Individual game tickets for the Dragons 20th Season Celebration Game are available now. Go to daytondragons.com/celebrationgame or Ticketmaster.com. Additional information on the Dragons 20th Season celebration including videos on the 20 Greatest Dragons, special 20th Season merchandise, and Dragons alumni listings is available here: https://www.milb.com/dayton/team/20. Again this season, all 140 home and road games can be heard on radio on WONE 980 AM and on the internet at wone.com and the Dragons Mobile App. Games can also be heard on HD Radio on 104.7 WTUI HD 2. The Dragons will again televise all Saturday and Sunday home games, plus a few Friday night games, on the Dayton CW.